Beheaded journalist's father: "I didn't know how brutal they were." "Western media fervently defend the fighting forces of a jihad movement that would just as easily behead them as enslave them but would never ever allow them to report freely as they are doing today. Even though they abuse that freedom, they enjoy it." 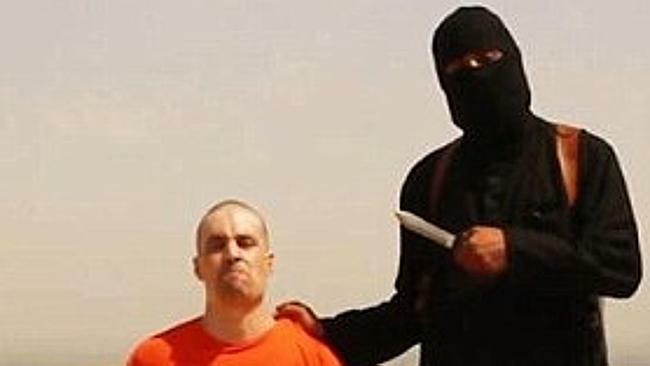 This week we were treated to the stark beheading video of American reporter James Foley. It is normal that the bereaved family would pay tribute to Foley's courage maintained "up to the last minute." He was on his knees. His last words were an indictment of his native land for conducting offensive air strikes against the Caliphate. It is fair to assume that if he had stood tall and faced the man who was preparing to saw off his head the video would not have been broadcast. If he had tried to wrest the knife out of the hands of his executioner we would never have known. Only videos of submissive victims are offered for the world's contemplation. That's Da'esh [I don't use ISIS or IS, I call them what they call themselves]. In another frame, in Gaza, we have surly black-hooded Hamas executioners pushing around some pathetic men accused of collaborating with the Israelis and shot on the spot. The condemned have what looks like paper bags on their heads. The truth hangs by a thread from Da'esh to Hamas. But the journalists, who could find themselves one day on their knees, mouthing accusations, ready for beheading, won't make the connection. They are already parroting the words of their eventual captors. 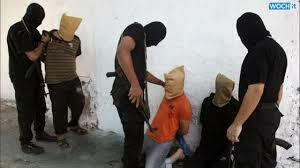 Western journalists in Gaza, submissive to Hamas, report on the summary executions with eerie approval. For example, Ian Lee for CNN. Yup! Collaborating in wartime is serious business. Some of the executions were public. Hmph! It's a warning to anyone that might think of giving information to the Israelis. The anchoress asks why they would do it. Well, there's the financial angle (Jews=money=corruption) and then maybe some of them are blackmailed. So, somehow, even as the camera focuses on the thick blood of the summarily executed, it turns out to be the fault of the Jews. And why are their heads covered? Maybe it's to protect their families, he surmises. Then again, some of them, says the bright guy, might be Hamas commanders. In fact they're all down-at-the-heels low level henchmen. You think a Hamas commander would be at the mosque in a stretched out t-shirt and shabby sandals? Even the killers, though dressed in black, look like nobodies. But the correspondent has never seen a proper Hamas fighter so how would he know? 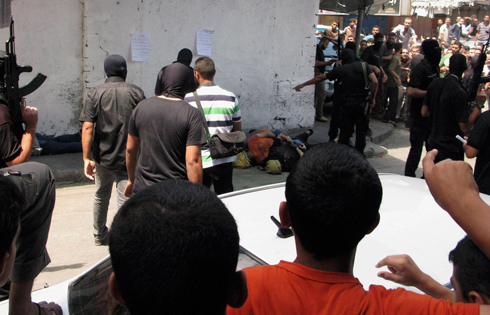 In Rafah, says a self-satisfied Lee, there was enthusiastic support for the killings. One man said they shouldn't shoot them they should burn them alive. Da'esh is classier. They provided a gentleman from London to wield the knife. (Though recent reports suggest the video was staged and the actual butchering was done by a stand-in or a pro). The in your face role played by the London bloke has caused some embarrassment to the British government. And led to the brutal interruption of President Obama's golf outing. The Brits put an A-team of forensic experts on the case, and may have already identified the chap that disgraced the Queen's English. The prime suspect, Abdel-Majed Abdel Bary, is the son of an Egyptian extradited to the U.S. for his alleged implication in the 1998 embassy bombings. Douglas Murray (see here) summed it up beautifully: "Just a bit more beheading than we are used to." Is it reasonable to add the risk of being kidnapped and beheaded to the fearless journalist's kit? With an added probability of sexual assault for the female of the species? War correspondents are a special breed, they willingly share the risks of soldiers and many have died on the battlefield. But hostages are humiliated, treated like dogs, exploited, and in some cases publicly beheaded to make an advertisement for the Caliphate. More often than not these captured reporters were there to tell the "other side" of the story, not hiding their sympathies with this or that "rebel" group or their antipathy to their own country. The French are notorious for bailing out their hostages, often with the help of Qatari intermediaries who already have their bank details, because they're directly funding the hostage-takers. Where is our collective dignity? Why do they get away with this? The truth hangs by a thread. While the Caliphate is slicing, the world is waffling, threatening to charge Israel with war crimes at the ICC. The West is on its knees. And telling Israel to swallow the medicine. Instead of proclaiming that we're not going to put up with hostage taking and beheading anymore, world leaders are pushing Israel to take its daily rockets and turn the other cheek. But the beheaded can't turn the other cheek! Here in France, the virulent pro-Hamas stampedes were followed by a flutter of pseudo-intellectual kill-the-Jews essays. Otherwise presentable journalists like Christophe Barbier fell into the snake pit. Western governments don't know what to do about the thousands of passport-bearing "citizens" now fighting with the Caliphate, some of whom will inevitably return with plans for small and big massacres. They don't know what to do about the pro-Hamas foot soldiers in Europe, tearing up the pavement, flying the black flag of jihad on our treasured monuments, attacking police, screaming unadulterated Jew hatred. They can't rescue society and the economy from a massive influx of unqualified, unsatisfied, hostile immigrants. So the likes of Barbier set up the last concentric circle of the Gaza-Israel lethal narrative: it's all the fault of the Jews. It's the domestic variation on the theme "Israel has to make courageous concessions." Friends like Nicolas Sarkozy sang the tune as they set foot on the landing strip at Ben Gurion airport. "Israel cannot be secure unless the Palestinians have a state." Barbier's variation goes something like this: French Jews shouldn't give in to fear, shouldn't run for safety to Israel, shouldn't clump together to defend themselves here and Israel there, shouldn't be too Jewish lest they be perceived as not enough French. As far as I can tell this kind of sniffling has also been heard in US and other European media. Elsewhere, the dawning recognition of the reality of Hamas, Da'esh, and jihad conquest leads to "mermaid discourse" that begins with the cold facts and ends with a writhing fishtail. Some Israeli leftists do the dance, granting that Hamas is intractable to any sort of civilized arrangement; everything has been done and repeated for more than a month to arrive at a pure and simple ceasefire that would have spared innocent Gazan civilians the hardships that befall them. It is common knowledge—ignored by most media—that Qatar has threatened to expel Khaled Mashal if Hamas agrees to an unconditional ceasefire. We know that Hamas had been planning to assassinate PA president-for-life Mahmoud Abbas...after entering into a unity government with him. Israelis, whatever their political persuasion or geographical location, won't put up with any more rocket attacks from Gaza. Not at the present rate of more than a hundred a day, not at the previous rate of a dozen here and fifteen there. Hamas must be defeated, say the mermaids, and then... ah, well then we have to get down to the serious business of creating a Palestine State. Gaza must be demilitarized, sing the mermaids, and who will take care of the store? Oh, that's easy: the international community. The UN? The EU? Or maybe the police force of Ferguson Missouri. The media were floundering. Hamas broke the last truce, Da'esh showed its sharp teeth, US Defense Minister Chuck Hagel suffered a premature Hallowe'en moment: Hey, those guys are really mean! They're worse than al Qaida. Four year-old Daniel Tragerman was killed by a mortar shell fired into his kibbutz close to the border with Gaza. CNN "rose" to that occasion with a brief exchange between anchor and correspondent on the same wave length. Sad, yes, you feel for the parents, of course, their personal loss but... But of course the death toll on the Palestinian side is a hundred times more. And you're surprised that Hamas is celebrating its victory? SkyNews, the BBC, and France 24 dipped into a bottomless barrel of moderate Muslims, adept at tongue lashing the West. My favorite was British MP Yasmin Qureshi, former aide to Ken Livingstone, who was allowed to speak from a genteel English garden background, with no contradiction within earshot. First, the facts: the Foley beheading has nothing to do with Islam. One of your contributors said it is an extreme form of sharia. That's not true. It has nothing to do with sharia. The ISIS people should be treated like enemy combatants. 99.9% of Muslims (in the world? in the UK? in her circumscription?) are against this disgraceful beheading. If they don't express themselves specifically as Muslims it's because it has nothing to do with Islam. However, many (most? 99.9%? all?) Muslims here in the UK are terribly upset by our government's policies in the Middle East over the past 30 years. They wouldn't kill people, they wouldn't behead anyone...We have to deal with all extremisms—Zionist extremism, neoconservative extremism, that's what created the problem we have now. The truth hangs by a thread. Israel can't solve the Hamas problem, the West can't solve the Da'esh problem, Nigeria can't solve the Boko Haram problem, Europe can't solve the demographic problem, and Qatar, cheered on by al Jazeera, keeps on pouring money into Western economies from its right hand pocket and into the maw of the caliphate with its left hand moneybags. The Cheikh Yassine Brigade put together a pro-Hamas party at Place de la République. About 200 attendees and apparently they didn't even manage to throw a single firebomb but they did get across the essentialist message: "We don't say the Zionists are Nazis, we say they are worse than Nazis." The Brigade is known for its credible death threats against Hassen Chalghoumi, accused of being a friend of the Jews and a miscreant. Chalghoumi, who has been under police protection for several years, is the imam everyone turns to when they need to say Muslims in France disapprove of this or that savage act. The big chiefs crawled out of the tunnels, the triumphant population gathered in the public square to celebrate their victory. In a work of fiction, the Israeli Air Force would drop bombs and wipe them out in one fell swoop. The story would be over. The perpetrators of evil would be eliminated with the cheering crowd, the falsifiers would go up in smoke, truth would have the last word. It didn't happen that way. The lethal narrative wasn't demolished by a happy ending. Hamas is celebrating in the rubble and Benjamin Netanyahu is getting a volley of rotten eggs. Still I'd rather be defeated like Israel than victorious like Hamas. A young Jewish couple was assaulted on the Upper East Side by men who rode off waving Palestinian flags. That is the victory Hamas is celebrating.